Discover the benefits of soapstone countertops. 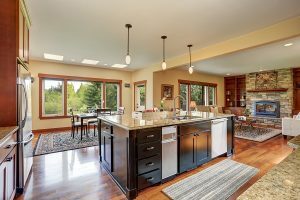 Whether you want are renovating your kitchen or building it from the ground up, you need to focus on the countertop space. You need to choose countertops that are durable and aesthetically pleasing. Soapstone is one of the most long-lasting and visually appealing countertop materials on the market. Discover a few of the benefits of investing in soapstone countertops for your kitchen. One of the major benefits of soapstone countertops is that they are highly durable, which is a necessity for any kitchen workspace. Soapstone is available in varying degrees of hardness, and the harder stone is used for countertops. The natural stone is widely used in a science classroom, which resistant a wide range of liquid and chemicals. So, soapstone will stand up well to heat and everyday wear and tear in your kitchen. You will never have to worry about a hot pan damaging your countertops. Soapstone is a non-porous material, so it does not absorb any liquid that might spill on to it. All you have to do is clean up spills will a towel or washrag. The material is also extremely dense, so you will never have to seal it. If you want to clean your countertops, you just have to use mild dish soap and a sponge. You will never have to worry about coffee or wine staining your beautiful countertops. Soapstone countertops are an aesthetically appealing, beautiful feature that will enhance the look and feel of any kitchen. Each slab of soapstone is unique so that you can place it in any home, from a traditional space to a higher-end environment. You can choose from a wide range of colors and textures for your soapstone countertops. The natural stone comes in several tones of whites, grays, and even greens. ROCK TOPS FABRICATIONS USES THE LATEST TECHNOLOGY TO ENSURE THAT YOUR NEW KITCHEN IS DESIGNED, CUT AND FINISHED EXACTLY HOW YOU WANT IT. WE HAVE OVER A DECADE OF EXPERIENCE AND HAVE BEEN CONSTANTLY IMPROVING OUR SERVICES AND OFFERINGS TO MEET THE DIVERSE NEEDS OF OUR CUSTOMERS. IF YOU ARE IN THE MARYLAND, D.C., OR VIRGINIA AREA AND LOOKING FOR A BEAUTIFUL NEW REMODELED KITCHEN, GIVE US A CALL AT 410-363-4257. FOR MORE INFORMATION AND TIPS ON MAKING YOUR HOME YOUR OWN, FOLLOW US ON SOCIAL MEDIA AT TWITTER, FACEBOOK, YOUTUBE, GOOGLE+, PINTEREST, AND HOUZZ. This entry was posted on Friday, November 30th, 2018 at 12:41 pm. Both comments and pings are currently closed.